You are here: Home / Internet Marketing / Do You USE YouTube? YouTube is one of the most familiar names on a website today. Out of written sales letters VS. Dynamic Salesvideos there is a higher number of action taken by the Video watcher. First of all the movement on a screen makes a person watch and waiting for a new “movement”. This works just like Hypnotism in a way. All of the commercials you see on TV are made to captivate you and to make you a buyer of their product. Personally, I stopped watching the News a long time ago to test out to see if my life would change after eliminating negatives. YouTube is Video based. And it is everybody’s favorite channel for entertainment. 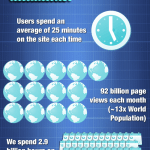 Some stats are on order to give you the full picture of HOW AWESOME this channel can be for your marketing. So, all in all, there is immense power in Video. When it comes to making videos there are many tools you can use. Personally, I use a program called Camtasia for recording my screen. It has been the Number 1 solution for marketers for a long time. Jing is somewhat the same but fewer options. This solution is great for making informative or educational videos where you “look over the shoulder” of the person recording. Having a good mic is essential though. Easy Video Player is one of the sweetest options when it comes to monetizing your video with built-in “call to action” buttons, watermarks and much much more. What I normally do is that I record a video first. When I go through the Easy Video Player options for my recorded video and add whatever I want. Posting of the video can be done from a number of places and should be done all over the web for maximum exposure. The easy option is to get someone to do that for you from Fiverr.com. Purchase highest rated video sharing gigs and be sure to get the most bang for your buck. After this is done your video will be LIVE on the web. When it comes to ranking your videos you should choose to do some research for your keywords and see if you have chosen an easy-to-rank keyword. Easy means: Go to Google and search for your keyword term. Are there any YouTube Videos ranking in the first place? If so, go to them on YouTube. Copy the tags and use them yourself. Go back to Fiverr.com And get backlink gigs for your video. One video equals three to five gigs. This is NOT the very best way. I have to be transparent with you and say it as it is. When it comes to ranking in the first place on Google there is competition in almost any niche and Google changes their algorithm without our opinion as marketers. They base their ranking system on REAL PEOPLE telling them what they LIKE. The social factor is greater than ever. This is why I cannot guarantee rankings, but only give you the head start of what I would do for my own videos. The ranking on its own will not happen overnight with this technique but it will increase your rankings. http://runeellingsen.com – Get the low down on Internet Marketing here FIRST! In this short description, our keyword is: Get the low down on Internet Marketing here FIRST! You must always be prepared to learn new methods as the world online changes every day. What you see here today CAN be changed tomorrow. Even though the odds are against rapid changes without warning… That is exactly what Google did when they changed their algorithm to include more relevant websites on the first page. Everyone who thought they knew how to rank a website had to drastically change their approach. With that being said it’s been a while since this post has been updated, but I added an link to VIDIQ at the top which you can use to gather insights and see what is working for others as well.